Green Punch is an energising and cerebral strain that drops bombs on the cranium in the form of sativa sensations. This lively experience eventually tails off into a smooth body high. Green Punch comes in swinging and lands heavy blows to the mind. 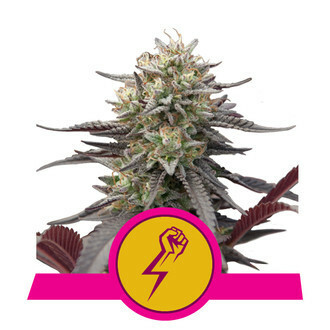 This sativa-dominant hybrid features 75% sativa genetics and 25% indica genetics, inducing a high that wraps the mind in an electric and buzzing sensation that is both motivating and inspiring. Green Punch was crafted in the grow room by breeding parent strains Green Crack and Purple Punch. This compatible match created a strain with an 18% THC content and low CBD values. This high is an excellent recreational choice during social gatherings and events, contributing to interesting conversations and novel ideas. It can also be used as a tool to enhance cognitive processes before long periods of work and creativity. The slight presence of indica genetics within this strain add a nice and subtle body high that contributes an underlying feeling of relaxation. Green Punch kicks out compact flowers that boast visually stunning colours of dark green and light purple. The slick look of these buds makes her a great choice for growers looking to attract attention and curiosity. Green Punch is a flexible strain that grows comfortably in both indoor and outdoor settings. Plants cultivated indoors provide impressive yields of 450–500g/m² and grow to heights of between 90–160cm. Indoor plants are well-suited to low stress training, enabling more bushy and lateral growth, as well as increased yields. Plants grown outdoors in fresh air and sunlight produce bountiful harvests of 550–600g per dried plant and grow to taller heights of between 180–220cm. Green Punch has a brief flowering time of 8–9 weeks, and outdoor plants will be ready to harvest at the end of September.